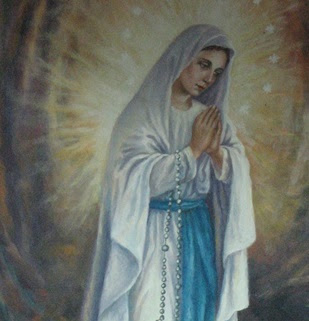 (Most Holy Mary): “My beloved children, on this day, I invite ye again to open your heart to God’s Love. God's Love has sought you like never before, with all His Love in these times of sin, of darkness and of hatred of God and of the Holy Catholic Faith. Yes, He has sought ye with all of His vehemence, wishes to enter in your hearts, wishes to live with you, unite Himself with you. Open your hearts to God’s Love, so that He can truly live within ye and from ye radiate Himself, transmit Himself to all hearts, to all the people of the world. Then, We, together, will raise a great barrier against Apostasy, against the loss of Faith and against all opposing forces against the Catholic Faith, the Holy Truth, and with the power of Love, of Prayer, We will crush evil together. Open your hearts to God’s Love, which sent Me Here and for 22 years now, every day, does not tire of calling ye back to Him though Me. God, through Me, offers ye Here a life full of peace, of love and of happiness, ye just need to accept it, say your yes and then, Our Will will be realized in your life. But for that yes to be perfect, you must renounce sin, your contrary will, rebellious to God's Will and give to God freedom for Him to do in your life what He wants. Then, the Lord's Holy Will will be fulfilled perfectly in ye and We will accomplish in your life and in your soul great wonders of grace of Our Love. My Apparitions Here, for more than 22 years now every day, is the great proof of My Love for all of ye, My children. Welcome My Love, correspond to My Love and pray the Holy Rosary every day, in order that the word accepts My Love. Divulge My Messages, do not be discouraged, because many souls will be saved through them. You will only have success in the dissemination of My Messages with prayer and you will overthrow all barriers that prevent them from arriving quickly to the attention of My children. I am very happy with All Those who have been praying the Hours of Prayer that I gave ye Here, faithfully day by day, to All Those who have done My Trezena with love and who endeavor to correspond to My wishes. To everyone today, I bless again from Lourdes, from Montichiari and from Jacareí.